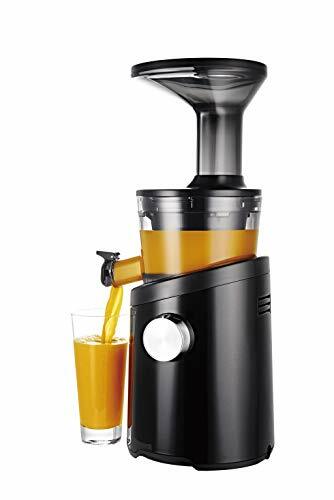 When I first saw Hurom H101 Easy Clean Slow Juicer, it feels like something is missing. Indeed, the old strainer and spinning brush are clearly out of the picture. It’s been replaced by a simplified top set, and the filter basket with small holes has been superseded by a grooved plastic one. These changes made the number of parts lesser, thus making it relatively easy to clean, as the name suggests. Maybe we’ll be seeing this design more often moving forward. It’s cheaper than Hurom HZ, but a little expensive than the HH Elite. Like its siblings it can process all types of produce, be it hard fibrous vegetables, soft fruits, leafy greens, and soaked beans and nuts. It’s a capable juicer which doesn’t compromise on nutrient retention and juice yield. The main advantage of Hurom H101 is its Easy Clean design. Both and HZ and HH Elite still have those bulky strainers which look like graters. If I were to choose between the three, I would choose the newer easy to clean model. Among all the cold press juicers that I have reviewed, Hurom H101 has the least number of parts. This makes assembly, operation, and cleaning a breeze. You’ll get it running in no time, and you won’t even need the manual. It was designed to make things easier for the juicing community. Hats off to the minds behind this fantastic juicing machine. While this machine is dishwasher safe, as the name suggests it’s still effortless to clean. The absence of the old strainer baskets filled with holes where pulp loves to stick around plus having lesser parts makes up for this flaw. This new Easy Clean design prevents residue build up. All you have to do is rinse the parts and let it dry out (based on the official product video). All it took for the model to clean the juicer was one minute. Obviously, when the situation calls for it, use the included cleaning brush and apply a dishwashing soap. Hurom H101 is not just easy to clean, but it also stands out in the juice quality department. Usually, vertical slow juicers have a speed of 80 RPM, but newer machines like the Hurom H101 have an optimal rate of 43 RPM. This made it even slower, yet the result speaks for itself. It produces bone dry pulp which means every drop of juice was extracted from your produce. And at the same time, you’ll get a flavorful and nutrient-rich juice in every ounce of goodness it produces. Have I mentioned that the parts of this amazing juicer are BPA free? What Kinds of Produce Can Hurom H101 Juice? This juice press can process all types of produce—soft & hard food, citrus fruits, leafy greens, and presoaked beans and nuts. Hard produce includes pumpkin, bitter gourd, cauliflower, watermelon, cucumber, garlic, cilantro, pepper, ginger, broccoli, apple, beets, carrots, pineapple, asparagus, yakon, pear, turmeric, celery, fennel, and sweet potato. Using the easy clean smoothie filter basket, you can make a puree out of mango, papaya, tomato, melon, peach, kiwifruit, avocado, grapes, pomegranate, blackberry, cranberries and strawberry. Leafy greens include collard greens, lettuce, spring onion, brussels sprout, dandelion greens, kale, moringa, cabbage, spinach, pine tree needles, peppermint, parsley, basil, wheatgrass and beet greens. If you want to add some texture to your citrus juice, use the smoothie strainer to retain some of the pulp. Your tangerine, lime, lemon, orange, mandarin, or grapefruit juice will never taste the same. This Easy Clean Juicer can also help you make milk out of oats, soybeans, or nut-based dairy alternatives. If you have a sweet tooth, this machine is also capable of producing healthy ice creams. What Hurom achieved in the Hurom H101 Easy Clean Slow Juicer was utterly revolutionary. It makes cleaning less of a chore. Period. If you’re the kind of person who likes a cold-pressed juice but hates the complexity of a juicer, not to mention cleanup time, then this machine is for you.